Natural Salt is an unrefined salt and loaded with trace minerals. What is the difference between natural salt and refined salt? Natural salt is pure, unrefined authentic salt with all of the trace minerals intact. It may be mined from ancient sea beds or produced by evaporating sea water. Refined salt has usually been heat treated and stripped of natural trace minerals. Various substances such as dextrose and anti-caking agents are added back in. There is a balance of natural sodium in a healthy salt, and it will contain essential elements such as calcium, potassium, phosphorus and magnesium. These elements are needed to maintain the balance of the body's chemistry. Many individuals with high blood pressure and fluid retention have found that this kind of salt does not aggravate these conditions like heavily processed and refined salt. Reading a label is very important. You need to know what to look for since all evaporated sea salt is not considered natural. If you find a sea salt that has additives such as dextrose and potassium iodide, it is considered a refined salt. 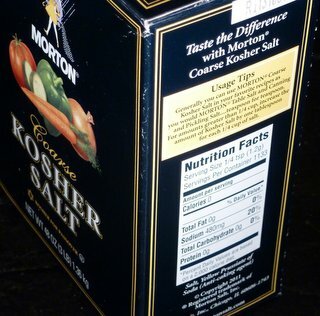 The following are some, but not all, of the ingredients that you may find on a refined salt container label. Any one of these ingredients means that the salt has been refined or processed. Make sure you read the label. Salt water makes up 72 per cent of our bodies, and the remaining 28 per cent is made up of minerals. Salt is crucial to maintaining a healthy body. One of the first procedures that medics provide trauma victims in emergency situations is to give them an IV of saline (salt) solution. This provides the body with fluid when there is loss of blood or when a person cannot take fluids orally and may be in danger of dehydration. It is also used for aseptic purposes. You can see the importance of salt for our bodies. Which Natural Salt is a Healthy Salt? 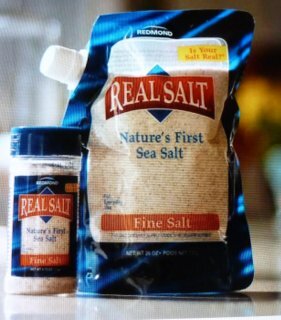 Real Salt is a natural salt that meets all the criteria of a healthy salt. It is mined in Utah from an ancient sea bed. This salt is loaded with 60 natural trace minerals. It comes to the market unprocessed except for the sizing of grains. It is different than the salts that we are familiar with that have been processed with anti-caking agents, bleaching, and refining. It has a slight pinkish cast. The mineral elements have a tan hue and a slightly sweet taste. The tan elements are mineral deposits that are easily digested. Dr. Robert O. Young, PhD., a microbiologist that promotes an alkaline diet for health, claims that this is the only salt that contributes to alkalizing the body. It is very unique and will help you to get your pH balance in order. A lot of the mineral content of the soils have been depleted over the years because of mass farming techniques. Natural salt made for you eons ago will furnish many trace minerals that we miss today in refined salts. It is a wonderful healthy addition to your pantry. Refined and processed salts have chemical additives and should be avoided. Many minerals also have been removed from refined salt. It is our opinion that the Real Salt brand and Himalayan salt (our favorite) are superior since they do not have chemical contaminants found in other salts today. Healthy Weight Loss - On a successful and healthy weight loss program you do not worry about counting calories. Benefits of Coconut Oil - are finally being revealed in our culture. Healthy Snack Foods - The important food values to look for are the total calories from fat and total sodium. Dried Fruit Nutrition - is abundant with antioxidants and fiber. Benefits of Soy Milk - The benefits of soy milk make it a very healthy substitute for cow's milk. Excellent Salt Substitute - Our favorite, Bragg Liquid Aminos! Stevia Sweetener - the uniqueness of stevia sweetener is that it is 150 times sweeter than sugar and has basically no calories. Cruciferous Vegetables - are known to reduce the risk of getting cancer. Vitamin B 12 - is needed for red blood cell formation, DNA processing and brain function. Processed Foods - also known as "convenience foods", make up over 60% of our food consumption in America today. These foods are loaded with chemicals and are very unhealthy, and can cause addictive responses to get you hooked. Then, we wonder why we love food! We are Hal and Barbara Reid. 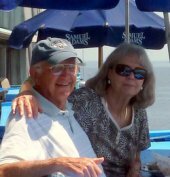 Hal had cancer in 1999, and we both decided to change our diet and lifestyle. © Copyright 2011-2019 Choose-Healthy-Eating-For-Life.com All rights reserved.